The Danish silver company Georg Jensen was founded in 1904 and by the 1920s it had shops all over the world- New York, Buenos Aires, Paris, London, Stockholm, and Berlin and by the 1950s Jensen even had a shop on the Queen Mary cruise liner. The son of a blacksmith and born in 1866, Georg Jensen grew up in a poor family in the little industrial town of Raavad north of Copenhagen. He always called it "a paradise on earth", fondly remembering its powerful oaks, towering beeches, and blue clay which he used to sculpture human figures. As a boy, he was sent to work at a foundry to help support his parents and seven siblings. When he was 14, his family moved to Copenhagen where he apprenticed with a goldsmith. In his spare time, he took drawing, geometry, engraving, and modeling courses during which time he decided to become a sculptor. While it was an improbable ambition for a working class young man, Georg passed the entrance examination of the Royal Danish Academy of Fine Arts and joined its sculpture class in 1887. After graduating in 1892, he first made art pottery while he married and had 2 children. After his wife died suddenly, he decided he would return to his old craft of metalsmithing to support his family making silver jewelry to his own designs. Finally, in 1904, he opened his own shop in Copenhagen and soon had 60 people working for him. His designs were a success, but his business acumen was not as he constantly needed to rely on new investors. Overall, his life was filled with personal sorrow having lost 3 wives as well as eventually the control of the company. In 1925, he left the company and moved to Paris to start a new workshop, but this venture was unsuccessful and he returned to Copenhagen. There, he rejoined the company as the artistic director where he continued to design for the company bearing his name until his death. 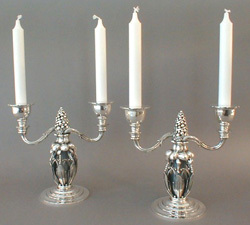 The Georg Jensen name has always carried the mantle of the highest quality silver, made using the most expensive techniques of production. Authentic Georg Jensen silver is also quite hard to find, for even in its heyday in the 1930s - 1950s the number of silversmiths employed varied between only about 200 and 250. Today, the firm employs only 12. At one time, Jensen made 33 flatware patterns, 23 of which are no longer produced, and about 1200 holloware items such as bowls, candelabra, pitchers, tea sets, trays, vases, wine coolers, and covered fish platters. Like Georg Jensen jewelry, many holloware pieces were embellished with semiprecious stones like amber, amethyst, garnet, lapis lazuli, malachite, opal, and quartz. Within a given flatware pattern such as the very popular "Acorn", Jensen created as many as 272 separate pieces including serving pieces, fish knives and forks, ice cream spoons, and a fascinating array of other utensils and utility pieces. While Georg Jensen silver comes in distinct Art Nouveau, Art Deco, and Modern styles, Georg Jensen himself was a follower of the Art Nouveau movemenet. His signature motif, the cluster of grapes, is part of his repertory of forms from nature which included berries, leaves, and fauna which he combined with lightly hammered plain surfaces. Over the years before his death in 1935, Jensen hired a series of talented designers who were allowed to go their own ways. the most noteworthy include Harald Nielsen (1892-1977), the young brother of Jensen's third wife Johanne Nielsen, Count Sigvard Bernadotte (1907-2002), the second son of Gustav VI of Sweden who was known for his classic geometric shapes like cylinders, spheres, and streaming elements, and Henning Koppel (1918-1981), a radical modernist whose unadorned biomorphic designs have become icons of their time and are in great demand. As such, Jensen's greatest talent may have been his ability to find and nurture other talents. One of the most talented, original, and influential silversmiths of the 20th century, Georg Jensen silver designs live on today as one of the most highly sought examples of the art of fine silver. Buy period Georg Jensen, Gorham, Tiffany, Edgar Brandt, Oscar Bach, Taxco, and other finer sterling silver and metalware on the Collectics Silver and Bronze & Metalware pages, or search the entire site for great antiques, collectibles, and crafts for every collector!